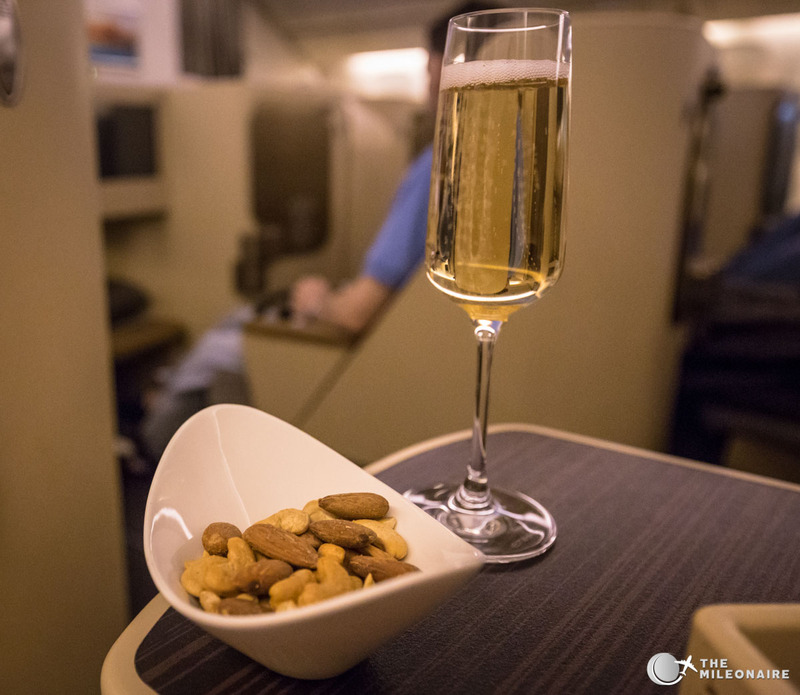 While I’ve already had the chance to fly with Etihad’s A330 Business Class and the new Business Studios in the B787, the Etihad Boeing 777 Business Class was somehow always left out. In June I finally had the chance to cross that off my todo list and experience the 777 from Singapore to Abu Dhabi on my own. After a short stop at Etihad’s contracted SATS Premier Club Lounge (OK, but nothing outstanding) the boarding began quite quickly. As usually with Etihad, boarding was done by status groups – so First/Business/Status Guests were allowed to enter the plane first. 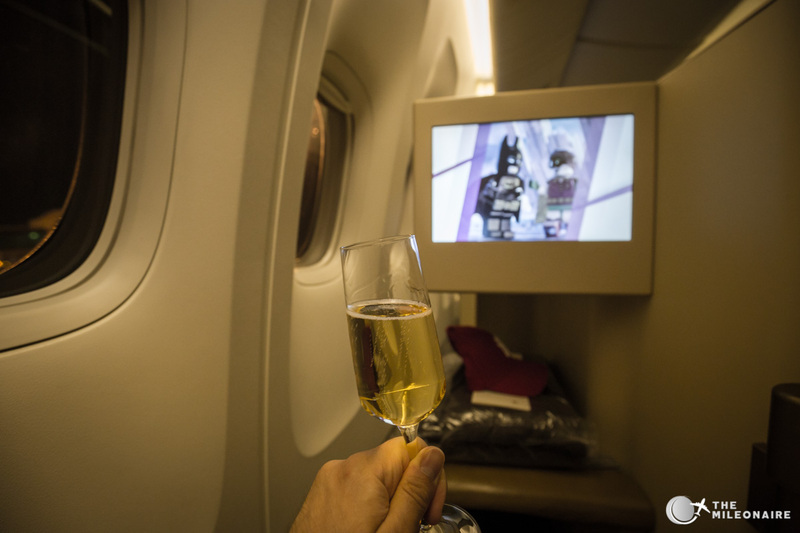 I was welcomed quite nicely, and led to my seat in Etihad’s Boeing 777 Business Class with a smile. 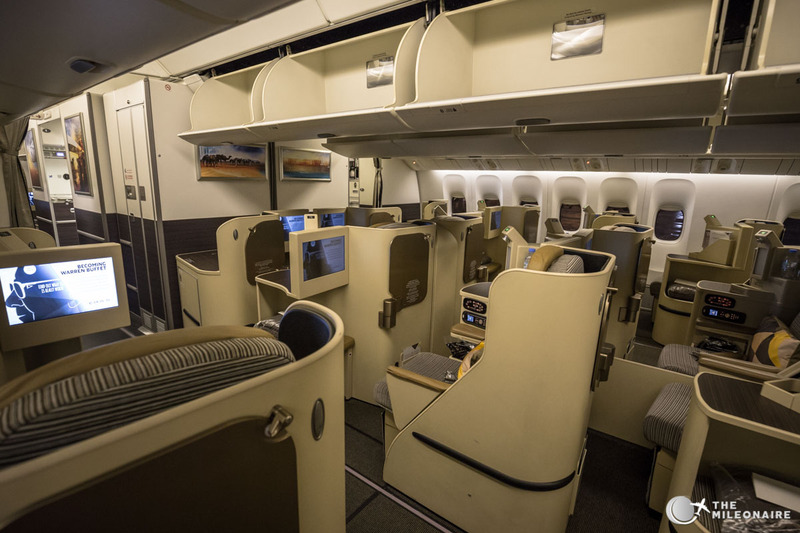 The Etihad cabin in the Boeing 777: lots of brown, beige and bronze. 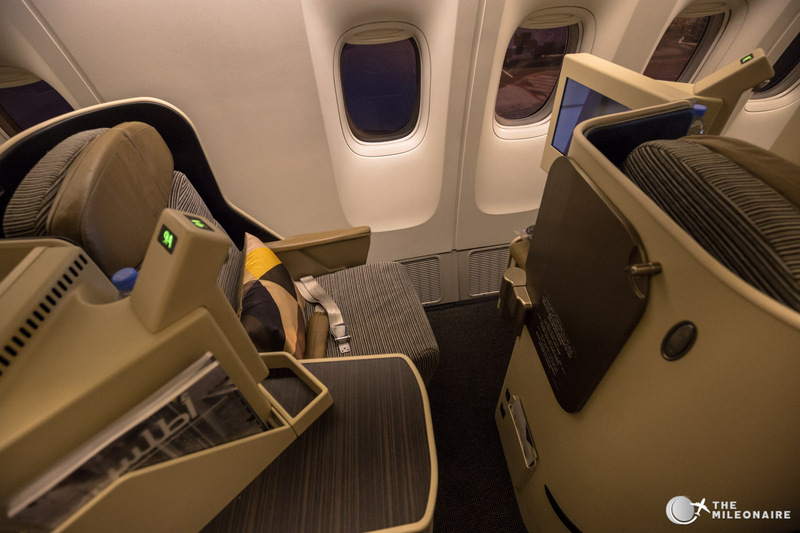 The cabin looks pretty familiar though when you’re used to Etihad’s Business Class in the A330: the seats are arranged in a 1-2-1 configuration and offer a great level of privacy for both couples and single travellers. 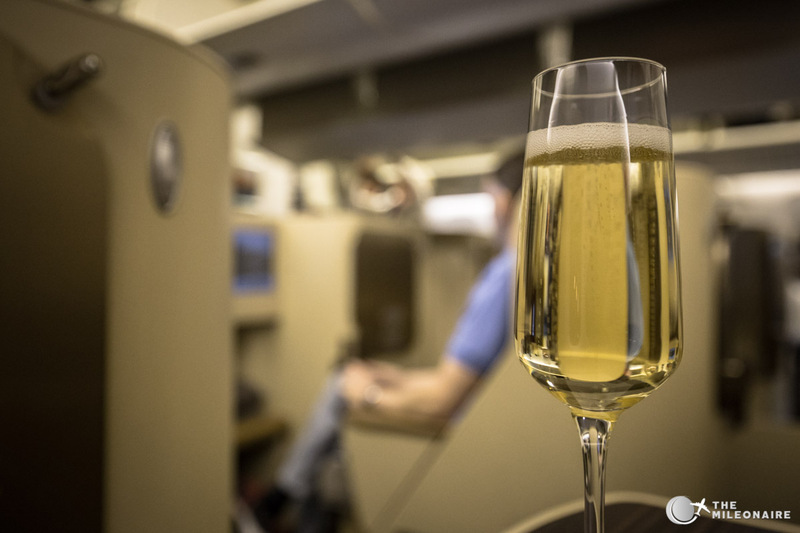 Especially when considering the width of the 777 (wider than the A330 and B787) Etihad is one of the very few airlines that does not field a 2-2-2 configuration – even though this would result in more seats to sell. Just as a thought: Emirates even has a 2-3-2(!) Business Class in their Boeing 777s. A wide cabin, but Etihad still sticks to the 1-2-1 configuration. 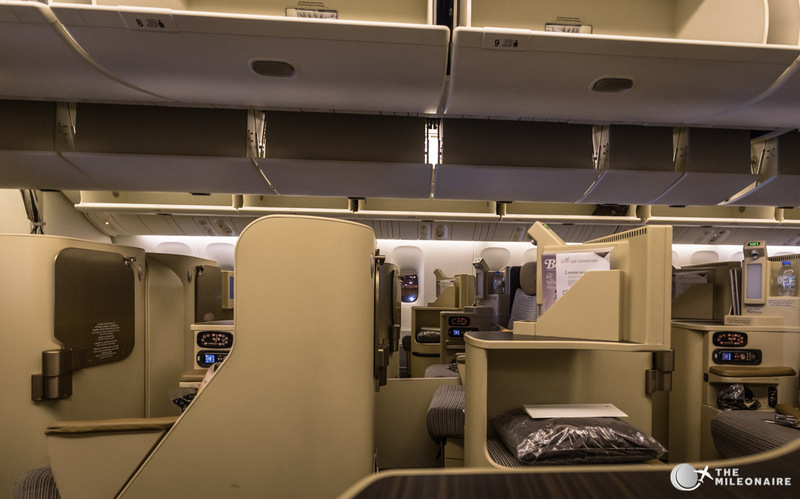 In contrast to Etihad’s A330 Business Class, the 777 features overhead bins also in the center of the plane. This negatively affects the spaciousness of the plane’s interior, but it still feels good. 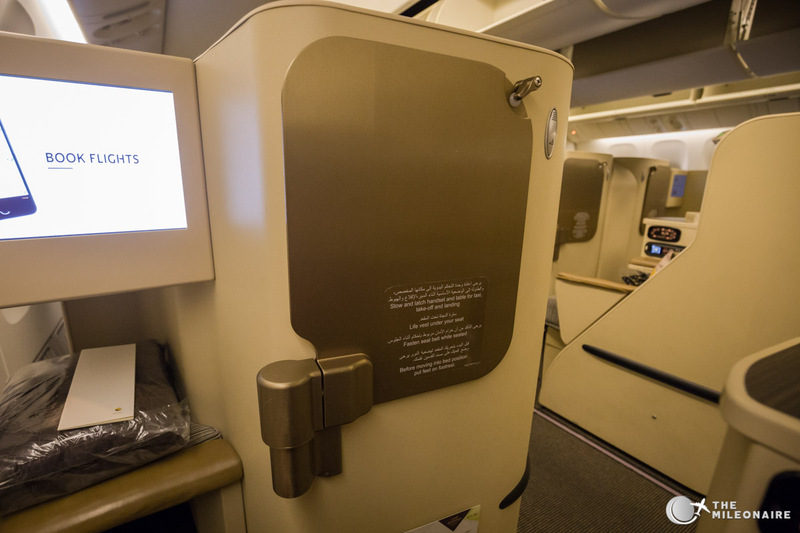 Depending on the configuration, the Business Cabin has a different length; in my case from SIN to AUH it was 7 rows á 4 seats each. The rows are not staggered, but the privacy level is still great – especially in the rows A & K. Beige and brown tones dominate the cabin, plus the copper/bronze highlights here and there.Even though a few brighter options would’ve been nice in my opinion, the overall look of the cabin has a classy feel to it. As usual I booked one of the “true” window seats in row “A”. I love looking out the window, and the privacy in that row is just great. 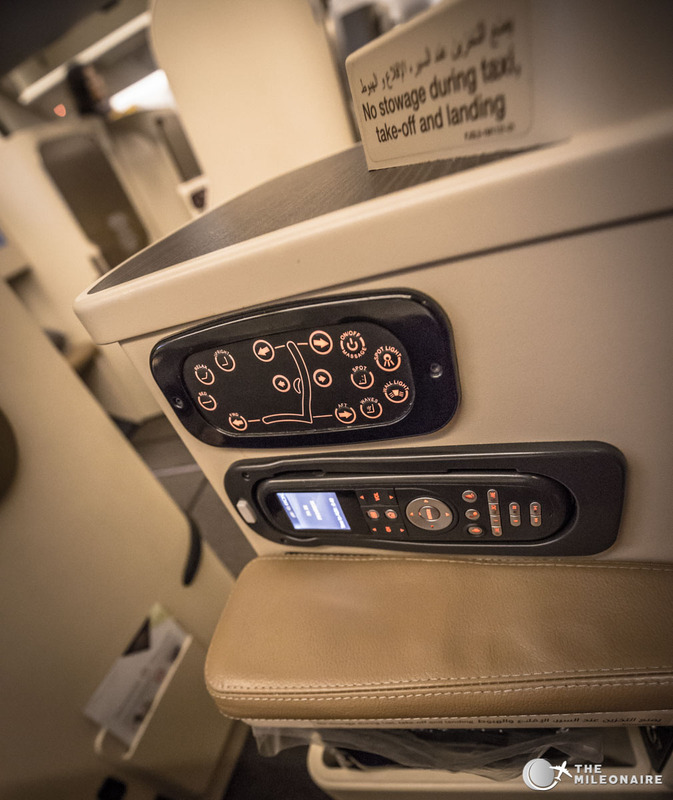 Obviously, all seats in Etihad’s 777 Business Class can be converted into lie-flat beds. The Business Class seat in Etihad’s 777: lots of space and a real lie-flat bed. Below the screen you’ll find an ottoman that can also be used as a foot rest in the “relax position” of the seat. That’s also where you can store your shoes. Cheers! 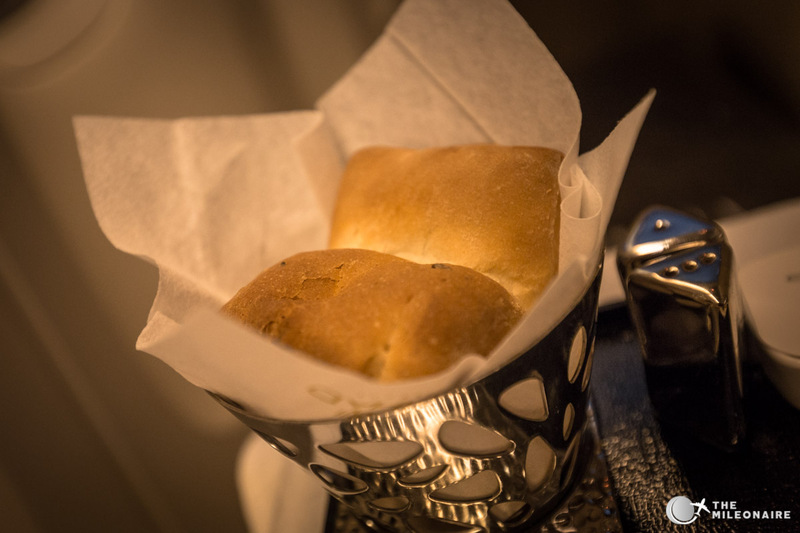 A blanket and the menu are already waiting for you on the ottoman. 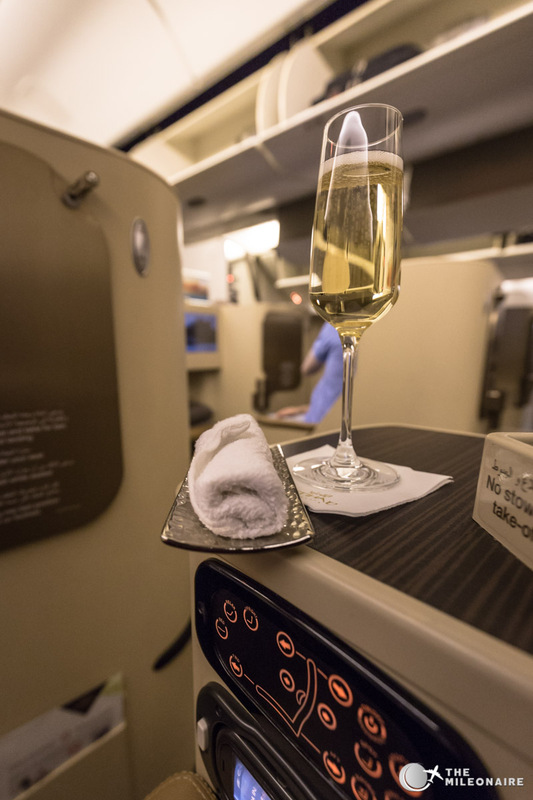 The Etihad flyers among my readers might have realized by now: the Business Class in the Boeing 777 is mostly the same as the one in the A330s. The seat is the same, just the cabin has some small differences (because it’s Boeing instead of Airbus). 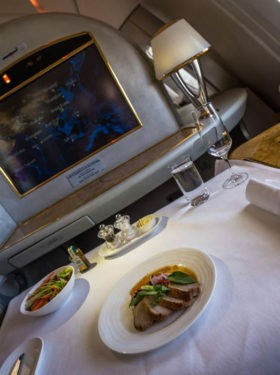 If you’ve flown the Etihad A330 before and enjoyed it, you’ll also like the experience in the 777. 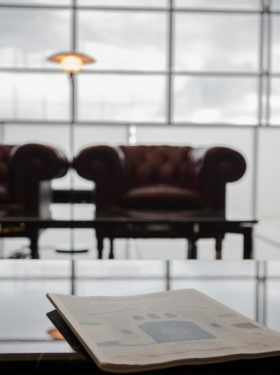 Only the Etihad Business Studios in the Boeing 787 are another step forward in terms of space and quality. This is always followed by a hot towel service, served on a silver platter instead of just getting a hot towel in your hand. 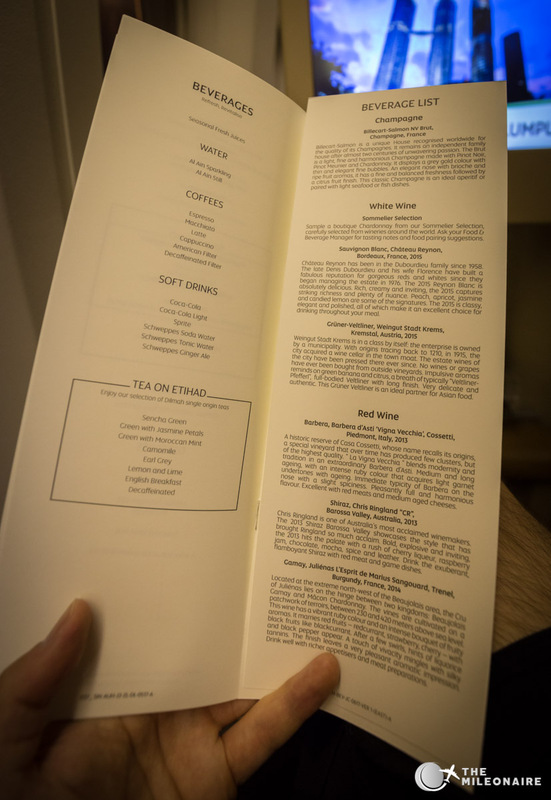 A recommendation on Etihad’s drink menu: the excellent Espresso with some brown sugar. I (again) chose the Arabic Mezze for my appetizer. This time they tasted a bit too sour and different from how they usually tasted. 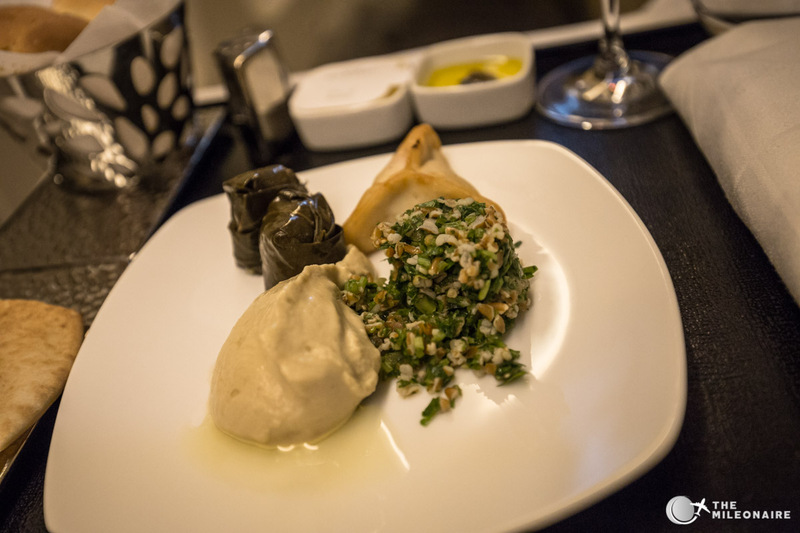 Arabic Mezze again: this time a bit disappointing. She was right: even though the dish looks simple, it tasted great. 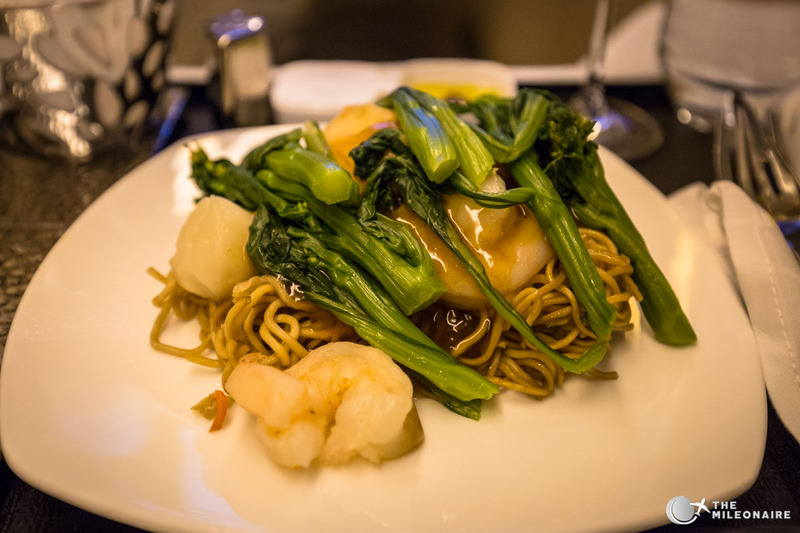 Prawns and scallops were cooked perfectly, and I’d rather have something tasty and simple instead of something complex but bland. 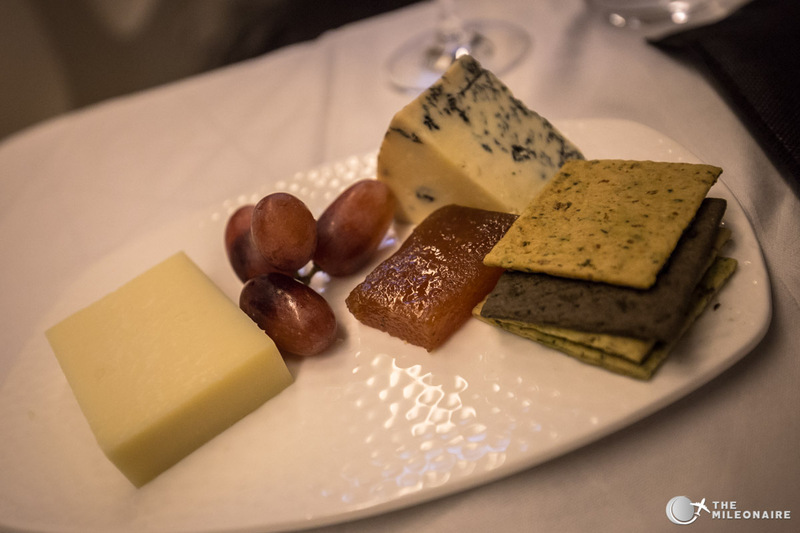 I chose to have the cheese plate afterwards, but it was a bit disappointing compared to the high standards Etihad normally has. It tasted well, but just looked and felt a bit too old and dried out. 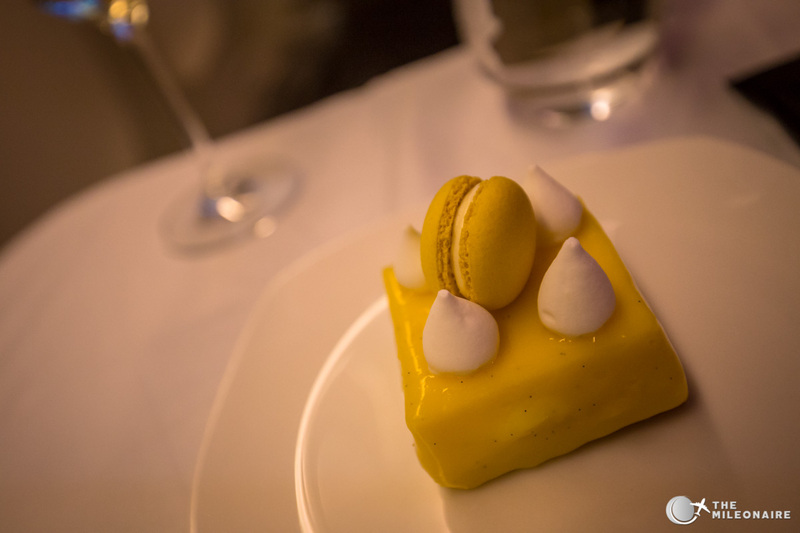 Another highlight at the end: a wonderful lemon tarte. After that good (but not perfect) dinner service I put my seat in the lie-flat mode and rested for a few hours. The bed is long and wide enough for my taste, so I got some good hours of sleep until we landed in Abu Dhabi. 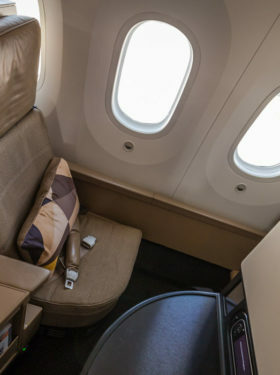 While most airlines nowadays try to cramp as many seats in their Business Class as possible, Etihad does the opposite: their Boeing 777 Business Class with its 1-2-1 configuration offers a lot space, a lot of privacy and a lot of comfort. 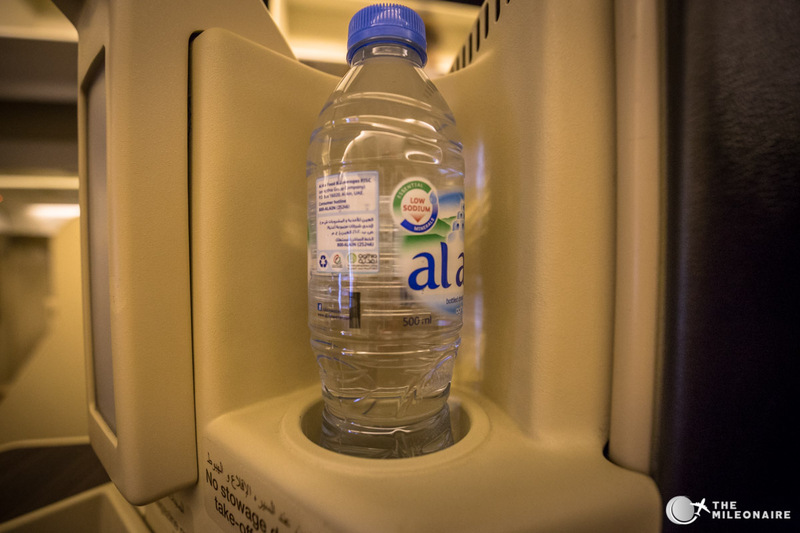 The hard product with the well-known Etihad seat is excellent, the soft product and catering as well. Even though the new Etihad Business Studios in the 787 are even a level above, the classic 777 Etihad product ist still ahead of most competitors.